Buy Aromamagic Nutmeg Oil for Arthritis, constipation, fatigue, muscle aches, nausea, neralgia, poor circulation, rheumatism, slow digestion. Eases muscular aches and pains. Helps digestion, nausea and diarrhoea. Arthritis, constipation, fatigue, muscle aches, nausea, neralgia, poor circulation, rheumatism, slow digestion. Nutmeg oil is distilled from whole, dried nutmegs that have been cut into small particles and pressed to remove the fixed oil, also known as nutmeg butter. The oil has the characteristic aromatic, volatile, oily-spicy fragrance of whole nutmegs. 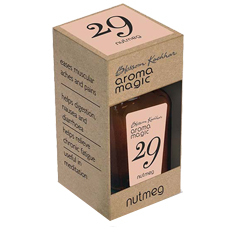 Nutmeg oil is a component in men's fragrances and spicy perfumes. Aromatherapy Nutmeg Oil : rejuvenating, uplifting, energizing.